I had a note this morning from my co-blogger. Carman is off to several reunions this summer while I hold the fort back here at home base, writing blogs, orienting a new team member (more of that another day) and generally taking care of business. Carman's note expressed an opinion about his own, somewhat "heavy" messages of late. He has been in a rather serious mood. Maybe a few weeks of camping with the folks will help shake him out of that. "I do need to lighten up" was one thing he said in his note. I know at our house, when we need to "lighten up" we get out the bubble stuff. There's just nothing like an afternoon blowing bubbles off the deck to give you a lift. Watch them float out over the garden, landing on flowers or perching on a blade of grass. See how long they can keep from popping. Sometimes they don't pop at all but just seem to dissolve and are not where they were just an instant ago. How big can you make them? How high will they float? How many can you get from a single dip into the bubble-juice bottle? Which wand works best? Try the red one, the yellow one, the blue. What else do we have in the kitchen drawer that might work as well--or better? 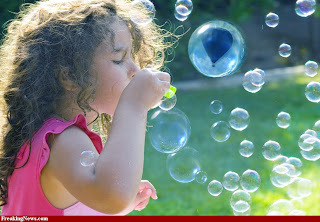 Oh I can go on for hours blowing bubbles on a summer day. Maybe this will be one of my Canada Day things to do. Have a great day; take it easy. Don't forget your sun block. And come on back next week, or next month, or whenever, all lightened up! Happy Canada Day! Now go blow some bubbles. Mmmm...it made me smile just to read about all those bubbles, but even more so, to imagine carefree children blowing them. Well, I'd like to think they are carefree; certainly more so than we adults! i think i may blow some bubbles this weekend at riverside... blowing bubbles just may be good for the soul!